ALBUQUERQUE, N.M. — When a meteor is about to conk your neighborhood and gives fair warning by emitting sizzling, rustling and hissing sounds as it descends, you might think that the universe is being sporting. 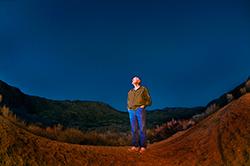 Sandia National Laboratories researcher Richard Spalding, recently deceased, examines the sky through which meteors travel. (Photo by Randy Montoya) Click on the thumbnail for a high-resolution image. So maybe atmospheric shock waves from the meteors are not the cause of the spooky noises.